Are you confused by what these letters mean? Can you define RGB and CMYK? Do you know how they affect your desktop publishing and website files? These letters represent two different color models or systems, (which are types of color definitions). RGB stands for Red, Green and Blue, with the first letter of each word represented in the acronym. RGB is an “additive color” system. Red, green and blue beams of light create the colorful images on your computer monitor. Where red and green light overlaps, you see yellow (see diagram at left). When red, green and blue mix together, you see white. The same is true for devices that electronically display or record color, such as televisions, monitors, scanners, digital cameras, cell phones, and color tablets. You should save your files in the RGB format for web sites, photos, animation, video capture, and scanning purposes. The CMYK color system works in the opposite fashion. 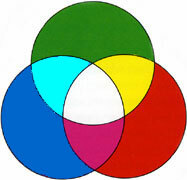 This color arrangement is known as “subtractive color.” CMYK are color pigments or inks used in the printing industry. CMY stands for Cyan, Magenta, Yellow, and the K stands for black. The combination of CMY inks creates gray. Black is added to deepen the shadows and to print solid black areas. Your files need to be converted into CMYK before a printer will be able to put your job on a press. When you look at a printed piece, the millions of colors that you “see” are actually made of only four colors of ink! For fun, take a magnifying glass to examine a printed piece closely. You will see thousands of tiny dots of cyan, magenta, yellow and black ink, which make small rosette patterns. The “K” in black is thought to be named after the K for the last letter in the word black. Actually, it is named after “keyline” which was the press plate that carried the text copy or keyline information and was always printed in black.